'I've Waited 44 Years': Capitals' First Radio Voice Finally Calls A Stanley Cup Final : The Two-Way Ron Weber, 84, called 1,936 games from their inception in 1974 to 1997. But he retired before they made their first (and for a long time, only) final. Now, he and the team have a second chance. 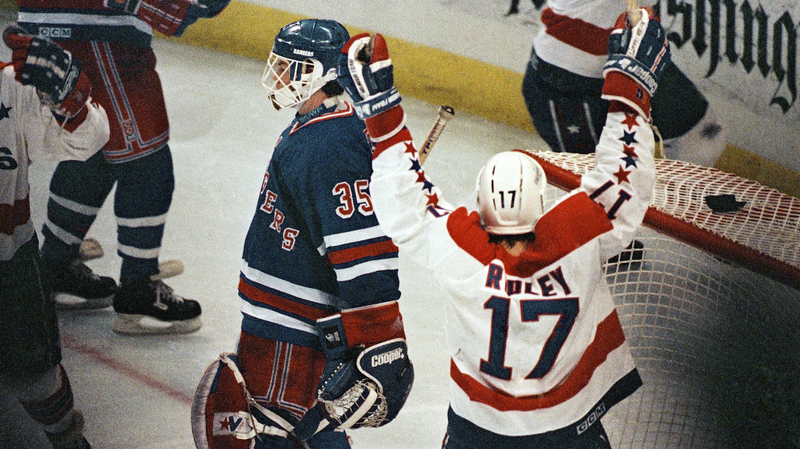 Washington Capitals center Mike Ridley celebrates his teammate Rod Langway's game-winning overtime goal against the New York Rangers in 1990. Later in the series, the Capitals would win again in overtime to take series and go to the Eastern Conference finals — and announcer Ron Weber was there for the famous call. For nearly a quarter century, Washington Capitals fans knew a simple, unchanging truth: If you were listening to a Caps game, you were listening to Ron Weber. As the franchise's original radio play-by-play announcer, Weber called a staggering 1,936 games. His voice described just about everything for fans across a 23-year span — from triumph to mediocrity, to sheer, unadulterated heartbreak. The Hockey Hall of Fame inductee was even there for their abysmal inaugural season beginning 1974, when that roster lost so many games, it earned the dubious distinction (by at least one estimation) of being "the worst team ever to skate on the ice." But in all that time, there was still one thing he never called: a Stanley Cup Final game. He retired in 1997, just one year before the Caps made (and lost) their first-ever final. Now, two decades after that Stanley Cup Final, the Caps are finally back for a second try — and this time, the 84-year-old Weber was there. The legendary voice of Caps hockey was back in the announcer's booth for Game 4 of the Stanley Cup Final against the Vegas Golden Knights on Monday. "Ron meant so much to so many Caps fans in his 23 years as the voice of the team. No one has deeper roots with this organization than he does," John Walton, the current voice of the team, announced on Sunday. "Absolutely thrilled to have him in the booth for this incredible moment in Caps history." Walton invited Weber to join the broadcast for the pregame show and the first part of the contest Monday night. "It'll be neat," Weber told The Washington Post. "How it will compare to other things I've done, I'd have to answer that after the game. It's something I've never experienced." Immediately on hearing the news, fans lit up Twitter with their nostalgia. "At Georgetown Law from '84-'87 I lived and died with Ron Weber!" Jay Feaster, a former NHL general manager, tweeted on Sunday night. Another longtime fan said, "[I] spent my whole childhood listening to Ron Weber's calls as I would fall asleep on game nights." One even still has a recording of his call from 1990, when an overtime goal put the Caps into the Eastern Conference finals for the first time: "The Capitals are closer to the Stanley Cup than they have ever been!" Weber belted at the time. And, after they lost their very next series, that fact would hold true for the better part of a decade, until they made their Stanley Cup run in 1998. If you happen not to be among the Caps faithful, Ben Raby of local news radio WTOP assembled a collection of some of his most iconic calls for your listening pleasure. But the distinguished veteran didn't jump right back into his old play-by-play role Monday. He left that to Walton, limiting his own role to commentary. Weber must have been a good luck charm: The Capitals beat the Golden Nights 6-2 to take a 3-1 lead in the best-of-seven series. "I want people to remember me from before I was over the hill," Weber had told the Post. "I'm due to have cataract operations coming up, so I don't think my eyes would be good enough to pick up all the numbers." It's a bit understandable if Weber doesn't trust his eyes at the moment — it's fair to say most Caps fans can barely believe what they're seeing, either. Just in case the team wins its first Stanley Cup in franchise history, Weber said he is not hanging up his hockey gloves yet. "I've waited 44 years," Weber told the Post. "[Capitals owner] Ted Leonsis is going to get an email from me to say how about letting the guy who's seen more Capitals games live than any other person on Earth be part of the victory parade. I would very much like to do that."